From Amsterdam to Paris, uncover the wonders of Europe over 25 days in all-inclusive luxury. Highlights include Arnhem, Cochem, Bernkastel, Honfleur and Vernon. Take your time getting to know the wonders of Europe. Journey across a continent swathed in culture, incredible cuisine and unending hospitality. Amsterdam provides an enchanting gateway to your river cruise along the Rhine River. Explore the Netherlands, marvel at the beauty of the Moselle Valley and the breathtaking Rhine Gorge before wandering the quaint streets of Heidelberg and Strasbourg. From northwestern France, explore châteaux, seaside towns and artist retreats before spending time in the great ‘city of lights’, Paris. Today, transfer to the airport for your onward journey to Paris. Enjoy a welcome reception aboard the luxurious Scenic Gem. Later, cruise out with beautiful Paris as a backdrop. 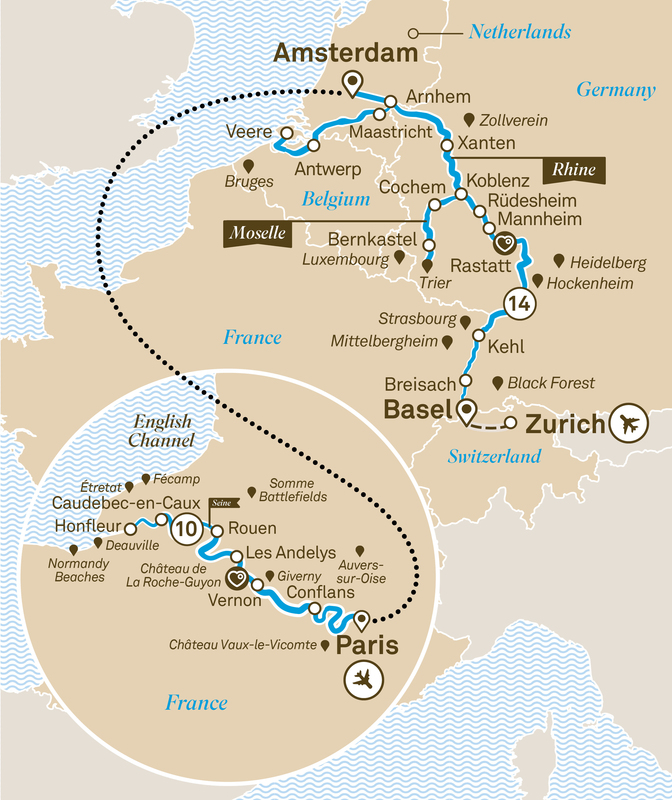 Explore Europe's most iconic locations on a 27 day adventure from Amsterdam to Tarascon. Travel through Germany and then into the heart of France.